Examining how land-use changes may affect water quality and fisheries resources in lakes and streams will help natural resource agencies manage wildlife populations, according to Steven Chipps, leader of the U.S. Geological Survey, South Dakota Cooperative Fish and Wildlife Research Unit at South Dakota State University. 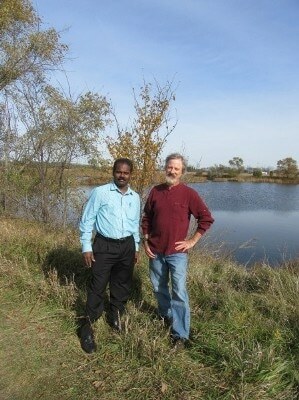 The fisheries biologist and Muthiah Muruganandam, a Fulbright scholar from the Indian Council of Agricultural Research, will use existing data to track changes in the characteristics and water quality of surface waters in northeastern South Dakota. As a senior scientist at the ICAR Indian Institute of Soil and Water Conservation, Muruganandam has been doing research on natural resource management and fisheries and aquatic system management, in particular, for more than 20 years. The 18-month research project is supported by the Fulbright Scholar program. Recent changes in land use have been well documented in South Dakota, according to Chipps, an adjunct faculty member in South Dakota State University’s Department of Natural Resource Management. Between 2006 and 2012, more than 1.4 million acres of grasslands were converted to cropland, with the largest change occurring in east central and northeastern South Dakota. The researchers will access more than 20 years of data from federal and state agencies including the Department of Natural Resources, the East Dakota Water Management District, U.S. Geological Survey and the South Dakota Game, Fish and Parks Department. “We’re doing a lot of data mining,” Muruganandam said. They hope to use long-term data from water quality assessments to evaluate relationships between beneficial water uses and land use patterns. Those beneficial water uses include fish and wildlife propagation, recreation and stock watering sources, in addition to more specific uses such as domestic water supply. Accumulation of sediment and nutrients, such as nitrates and phosphates, adversely impacts water quality, according to Muruganandam. Increased vegetation, lower oxygen levels and decreased water clarity can adversely impact recreational fish, such as yellow perch, bass and crappies. However, Chipps explained, “A lot of things come into play, not just land use.” Northeastern South Dakota typically goes through cycles of drought and flooding that affect water availability and aquatic production. “That dynamic has gone on for eons,” he said. The researchers hypothesize that current approaches for dealing with excess water, such as wetland draining and tiling, could stabilize water levels in small lakes and impoundments. This then interrupts the normal ebb and flow that is advantageous to fish populations. “If the data show that lake water levels are becoming more stable, this will change how we look at managing fish,” Chipps noted. Environmental impacts on water resources can put pressure on aquatic ecosystems that, in the short term, can have a more dramatic effect than climate change.